I ran across the picture above in my Facebook find and thought that this picture is worth a thousand words. If you take a look at the roof of the school bus, the instructors painted 5 steps for the students to follow. The picture was posted on the City of Turlock – Fire Department Facebook page from some training the had on their new Paratech rescue equipment. So what do school buses weigh? Type A1 GVWR of less than 10,000 lbs. Type A2 GVWR of more than 10,000 lbs. A popular style Type A introduced in 2004 was rated at 14,000 lbs. GVWR. Type B GVWR of more than 10,000 lbs. Type C GVWR of more than 10,000 lbs. Type C school buses typically range between 23,500 lbs. to 29,500 lbs GVWR, depending on seating capacity. Type D GVWR of more than 10,000 lbs. 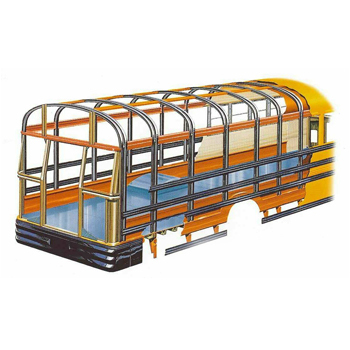 Type D school buses typically range between 25,000 lbs. to 36,000 lbs. GVWR, depending on seating capacity. * Gross vehicle weight rating ( GVWR ) is the estimated total weight of a school bus that is loaded to capacity, including the weight of the vehicle itself plus fuel, passengers, and other miscellaneous items such as extra aftermarket parts.